Recently our friends at Dollar General reminded us that it doesn’t have to be a holiday to give someone you love a gift! It is so true and it really inspired me to think about pampering a good friend of mine who always puts others first, works so incredibly hard, and never really seems to take a moment for herself. 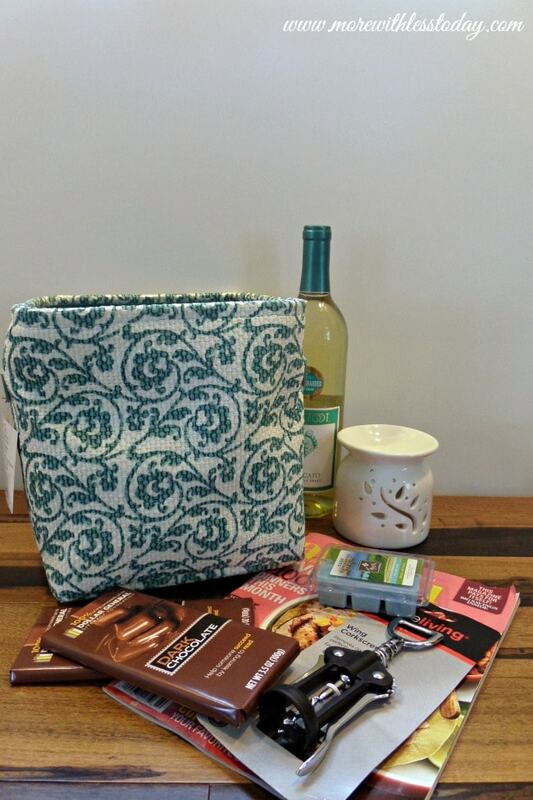 I set out to make a Pampering Gift Basket for her and found everything I needed at my local Dollar General. Dollar General offers so many items. Whether you need groceries, something for baby, apparel, cleaning products, or toys you can find what you need at Dollar General. My parent’s have a little guest cabin that sits empty during the winter months. I arranged for my friend to spend a night away for some peace and quiet and a little time for herself. I put together this little Pampering Gift Basket to greet her when she arrives. I found a beautiful soft sided bin at Dollar General that fits perfectly with her home decor. I decided to fill it with items she wouldn’t normally get for herself and wrapped each in tissue paper inside the bin. I wrapped the whole basket with cellophane (that I also found at Dollar General) and tied a bow at the top. I knew my friend would be staying for the night so included a bottle of her favorite wine and a fun corkscrew. I also added a beautiful wax burner and some scented wax melts. I picked scents I thought would help her feel relaxed. I grabbed a copy of her favorite magazine and 2 dark chocolate bars. Everyone should indulge once in a while! Dollar General has great everyday prices but they also have coupons to help you save even more. While I purchased everything at my local store, you can also Shop online and save with Dollar General! Simply have items shipped to you, search and print digital coupons, and more. If you don’t already, be sure to follow Dollar General on Facebook or @DollarGeneral on Twitter. 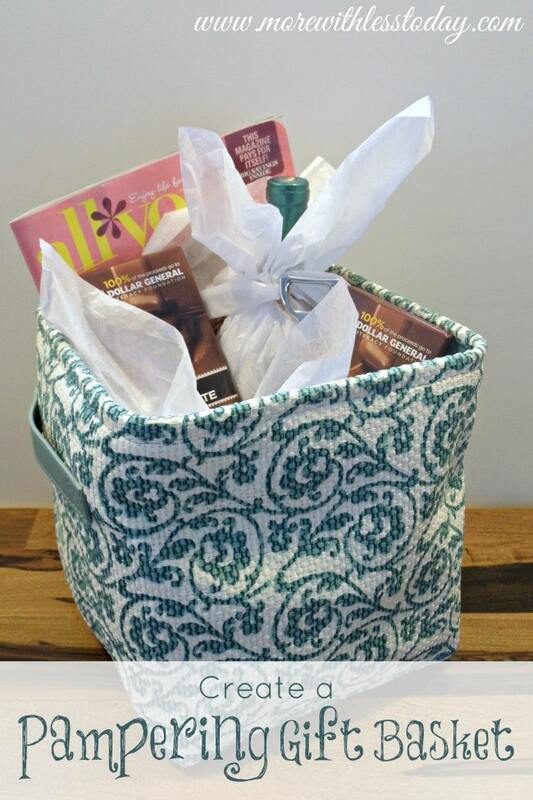 I cannot wait to surprise my dear friend this weekend with her Pampering Gift Basket! I know she will enjoy it as much as I enjoyed shopping for the items and putting it together! 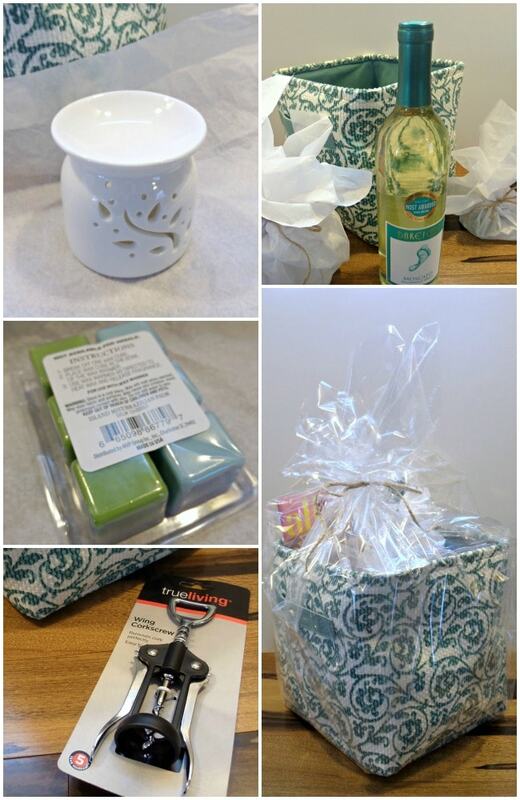 What would you purchase at Dollar General to pamper someone you love?